Sometimes the order in which you do things can make or break a situation, like when putting on your clothes or disconnecting a car battery. While you won’t look like a fool or get electrocuted if you get the order wrong, making this parfait falls under that category. Sure, you can mix your favorite granola into a bowl of yogurt but you can’t call it a parfait. Similar to Peanut Butter Cereal, eating this is an experience akin to digging for gold, or in this case, liquid nuts. 1. Layer the ingredients into a bowl, in the order listed above and as depicted below. 2. Take a large spoon and start digging. Make sure you get some of each ingredient in every bite. You can use creamy, chunky or flavored peanut butter as well. As for the granola, I highly recommend Dixie Diner’s Apple Berry Granola. It’s almost scary how tasty it is while still providing 11g fiber per serving. I strictly ration it out only for these parfaits. It’s a little expensive but shipping from Netrition is only $4.95 independent of order size, so order at least 5 bags at once – trust me. Very delicious! I ofter use cubed apples or peaches instead of banana. You can use any flavor yogurt you prefer. I sometimes throw in a handful of salted peanuts for added crunch and flavor. I think the Dixie Diner Granola is the key because it’s a bit chewy like a soft oatmeal cookie. Yum! Thanks for this idea. I had this for breakfast this morning and it was delish! I only had mueseli (sp?) on hand, so I used 1/2 c of that in place of the granola and dried fruit. Very yummy and satisfying! Excellent! I’m glad you tried it, it really is incredible. Most people (Eli, my mother and I included) are a little put off at first because of the peanut butter and yogurt combo, but it works so well. Mueseli sounds good too, but I really recommend that granola I talk about above. It’s a bit expensive but so high in fiber while being very low in fat and sugar. I usually don’t add the dried fruit either, it’s a fairly large and satisfying meal as is. Mmm! Thank you for this inspiration. I made a PB Parfait for lunch today and I’ll be posting about it on my blog tomorrow morning. It’s a great combo, thank you for providing me with a nice meal. I jumped on the TJ’s peanut flour bandwagon! It really is crazy delicious. I made parfait combining honey yogurt with the flour and adding some sliced banana and PB granola. Um it was amazing. This looks delicious. What a wonderful combination! I love yogurt too. I can see how eating it is a delicate operation because you want to get all of the flavors on one spoon. I love mixing fresh fruit and Kashi Go Lean cereal with my yogurt! Sometimes I’ll add almond butter or maple syrup too- tastes like dessert for breakfast! I also tweeted about this giveaway! My username is @stretchjean. Hope to win! There’s so much protein in Greek yogurt, so added peanut butter packs even more of a nutritional punch! I totally do this! Some days I keep it layered, but honestly when you kind of whip together the peanut butter, yogurt and bananas, and then re-fridge it for a while, then add granola…oh my word. So crazy good. Wanted to thank you. Have been on a weight-restoration diet after a gross year of not eating, and in the journey have ended up using peanut butter in every meal. Often look to your blog for recipes, and every single one has been delicious. So, FANKS. My favorite way to eat Greek yogurt is when it is mixed with overnight oatmeal, cocoa powder & raisins. I love to eat yogurt just the way it is! However, it’s even bettter when mixed with granola and berries then put on my pancakes! That is a good start to the day!! My favorite way to eat yogurt is with a SPOON, or with fruit! I usually layer parfaits the opposite way you do so I’ll definitely try it this way. My favorite way to eat yogurt is in overnight oats with lots of peanut butter of course. My yogurt concoction is similar: plain greek yogurt, strawberries, peaches, a dash of cinnamon, and then either PB or almond butter. So good and filling! hehe, i love it with fruit and oats, or a sprinkle of flax and wheat germ! w/ seasonal fruit and yogurt – yumm. Today was greek yougurt with banana, touch of maple syrup and falx seed granola. Fill me up breakfast! I don’t like to mess around with my yogurt too much. I travel a little ways to a really nice bakery that makes their own granola and garnish my yogurt that way. Yum. This looks so yummy and to think I was perfectly happy eating my Chobani piled high with fresh berries and my homemade granola! Plain nonfat yogurt with frozen berries, flaxseed and cinnamon! No sweeteners required! This sounds really good, and I have everything on hand to make it! 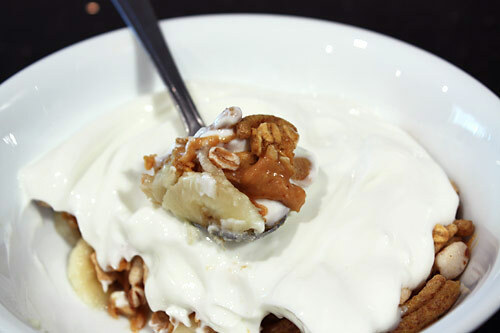 My favorite way to eat yogurt is with a drizzle of almond butter and some granola or cereal. Or on top of toast! I love yogurt so I just eat it plain but your recipe looks terrific! I like eating plain greek yogurt with granola and fresh fruit! I love eating this yogurt blended into a smoothie!!! Take a peach chobani, add some vita juice and frozen fruit and voila! Love it. Also, LOVE PEANUT BUTTER! I would like to try adding the plain to PB and Banana like you did above. I am known to slice Bananas and top with natural PB as a snack!! I always eat my chobani fruit yogurt with nut and honey granola on top! its SO delish! And once I even made my own parfait, with chobani yogurt + granola+strawberries+yogurt+mangoes+granola+yogurt! it was sooo goood! Wow, thanks for such a great giveaway! 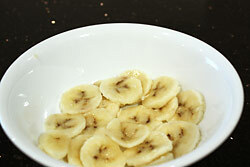 My favorite way to eat Greek yogurt is to top it with sliced, frozen bananas! Try it, it’s addicting! 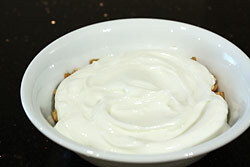 I love to eat yogurt with a bit of vanilla soymilk and or with chopped apples, cinnamon and stevia. It might sound wierd but i prefer my yogurt as savory. I tried it with spinach ginger, pepper, and chickpeas once for pretty good indian inspired dish. In order for it to taste good sweet, to my taste buds anyway, requires way too much sugar. I have been having my own homemade pumpkin spice granola and pumpkin butter with my yogurt. This does sound interesting though. 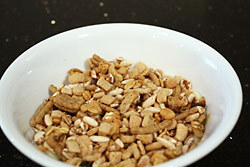 I usually add some muesli or dried cranberries and slivered almonds to my yogurt. I make a smoothie similar to this. Greek yogurt, HEAPING tablespoon or two of all natural PB, banana and some apple juice. Drinking it now! I recently discovere and have now fallen in LOVE with Chobani. Your combining it w/ PB is ingeniuos. Thanks for sharing! Love it with mascerated strawberries — just like buying the fruit-on-the-bottom type stuff but probably so much healthier and more natural. I LOVE peanut butter but never tried it with yogurt… will have to give it a chance! I LOVE your recipe. Combining Chobani and PB – ingenious. I love my yogurt with fresh fruit, dry oatmeal, and a little maple syrup. I love parfaits and a parfait with peanut butter just makes them that much better! :-) Thanks for the recipe! Haha, very nice. It stayed well in the bowl overnight? The cereal/granola didn’t get too mushy? How healthy is this? Would it work as a whole meal for weight management program? Absolutely. Just choose the healthiest ingredients you can (nonfat plain greek yogurt, natural peanut butter and a cereal that’s whole grain, low sugar and high protein). Made this this morning for breakfast. Absolutely delicious!! The greek yogurt I have is REALLY sour so next time I may put honey or agave nectar to sweeten it up a little bit. But this is seriously delicious! The only thing that makes waking up at 5:50am not so horrible is my peanut butter breakfast :) thanks so much for this! So glad you like it! I completely agree with you – there’s nothing like a killer breakfast to get you out of bed every morning! And yes, add a little honey, agave or maple syrup to the greek yogurt if it’s too sour for you. Also, try Voskos greek yogurt, it’s a lot less sour.